There is a lucrative new sport in the Wiltshire village of Luckington: fishing stranded motorists out of a ford at £25 a time. Since a road closure, dozens of drivers have blithely followed directions from their satellite navigation systems, not realising that the recommended route goes through the ford. Normally the water — the start of the River Avon — is about 2ft deep but it can swiftly double in depth after heavy rain. Every day since the main B4040 was closed after a wall collapsed on April 8 one or two motorists have been towed out, having either failed to notice or ignored warning signs. Some farmers have been charging £25 to give a tow with tractors. Julie Jackson, 45, of Carterton, Oxfordshire, and her mother, Delcie Fielder, 70, had to abandon their Rover 220 in mid-stream after “we heard this gurgling sound and water came right into the car, covering our feet”. Sat-nav sales have increased five-fold in the past two years, the market research organisation Mintel says, with drivers in Britain spending £305 million on systems last year. But they are not foolproof. This month motorists were sent to the edge of a 100ft drop on an unclassified road at Crackpot in North Yorkshire. Weil die GSM-Technologie für breite Bevölkerungsschichten zu kompliziert ist, entwickelten die Finnen "für Leute mit begrenztem technischen Verstand" das Einfachgerät "rinGO". Doch dessen Marktchancen sanken, als Nokia die Zielgruppen definierte: Frauen und Rentner. Ein Nokia-Sprecher beeilte sich mit dem Dementi, es handele sich keineswegs um ein "Bimbophone". Merke: Hinter jedem Fettnäpfchen lauert ein neues. An 84-year-old man who was suffering from silicosis, severe chronic airflow obstruction, anemia, atrial fibrillation and congestive cardiac failure, was admitted to hospital for the treatment of distressing breathlessness at rest and gross peripheral oedema. With bed rest and increased diuretic therapy he slowly improved but remained severely debilated, requiring assistance with showering and going to the toilet. While seated on a shower chair with a plastic seat (see figure) his left testicle descendet through one of the perforations in the seat and could not be extracted until the hospital's engineers cut a larger perforation to permit his seperation from the chair. All hospital equipment needs careful assesment for possible hazards to patients and staff. 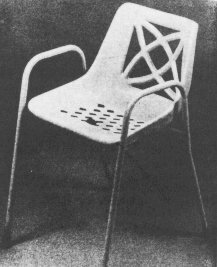 The design of this chair was defective in the choice of the size of the perforations in the seat (3.0 X 2.5 cm). The incident was distressing for both patient and hospital staff and expensive in terms of time and destruction of equipment. Caller: "The cup holder on my computer is broken and I am within my warranty period. How do I go about getting it fixed?" Tech Rep: "Please excuse me if I seem stumped, it's because I am. Did you receive this as part of a promotional at a trade show? How did you get this cup holder? Does it have any trademarks on it?" At this point the Tech Rep suddenly understood. The caller had been using the load drawer of the CD-Rom drive as a cup holder and snapped it off. Das war für Oma zuviel: Ihre Enkeltochter (6) war im elterlichen Haus in Bad Dürrheim (Baden-Württenberg) in den Wäschetrockner gekletter und hatte die Klappe hinter sich zugezogen. Die Großmutter wollte das Kind befreien, verwechselte aber die Schalter und setzte den Trockner in Gang. Das Kind wurde durchgeschüttelt. Jetzt trat die alarmierte Polizei in Aktion. Sie befreite die Kleine, die mit einem hochroten Kopf die Prozedur überstand. Die Oma erlitt allerdings nach der Rettung einen Schwächeanfall. W. Poppelreuter in Psychotechnische Zeitschrift, Jahrg. 8, Nr. 1, S.34f.